Conversion Technology, Inc. (CTI) offers gap analysis to determine your facility’s compliance status with the Boiler MACT rule. CTI offers to assist sources in complying with every aspect of the rules’ requirements. The full names of Boiler MACT and GACT or Area Source as published in the Federal Register 40 CFR Part 63, are as follows: Boiler GACT (Generally Achievable Control Technologies), in short refers to the USEPA’s National Emission Standards for Hazardous Air Pollutants (NESHAP) for Area Source: Industrial, Commercial and Institutional Boilers. Boiler MACT (Maximum Achievable Control Technology) refers to the USEPA’s NESHAP for Major Sources: Industrial, Commercial, and Institutional Boilers and Process Heaters. Boiler Area Source is a boiler in a facility (industrial, commercial or institutional) that its actual emissions of Hazardous Air Pollutants (HAP) are less the 10 tons per year of any single HAP or less than 25 tons per year of all HAPs combined. EPA allows Boiler Area Source facilities the use of Generally Available Control Technologies (GACT) or management practices to reduce emissions of hazardous air pollutant (as compared to Boiler MACT facilities explained later requiring stricter practices). Therefore, the Boiler Area Source is also referred to as Boiler GACT. See the Applicability Chart to determine how your boiler is classified. The Boiler MACT rule applies to new and existing boilers and process heaters at major source emitters (commercial or institutional) of Hazardous Air Pollutants (HAPs). In the context of this rule, major sources are defined as having actual emissions of HAPs in excess of 10 tons per year of any single HAP or 25 tons per year of all HAPs combined. If your facility possesses a Title V or Part 70 (Major Source) Air Quality Permit, this does not necessarily mean that the Boiler MACT applies to you. A Title V Air Quality Permit signifies that actual emissions of at least one criteria pollutant (e.g. particulate matter, carbon monoxide, volatile organic compounds, etc.) exceed 100 tons per year for non-HAP pollutants or the 10/25 ton per year HAP thresholds previously stated. If permitted emissions of HAPs are below the major source thresholds, Boiler MACT does not apply to you; however, Boiler GACT may. 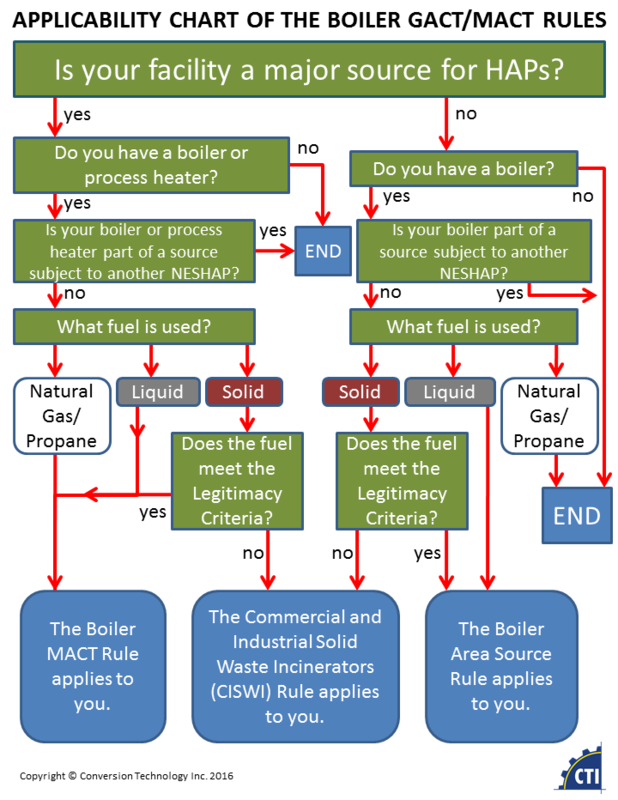 See the Applicability Chart to determine how your boiler is classified. The material is used as a fuel that remains within the control of the generator (whether at the site of generation or another site the generator has control over) and meets the legitimacy criteria. (for the definition of legitimacy criteria, please see 40 CFR 241.3 (d)). The material is used as an ingredient in a manufacturing process (whether by the generator or outside the control of the generator) that meets the legitimacy criteria. The material has been sufficiently processed to produce a fuel or ingredient product that meets the legitimacy criteria. The material that has been determined through a case-by-case petition process not to have been discarded and to be indistinguishable in all relevant aspects from a fuel product. Dewatered pulp and paper sludges burned on-site at facilities that use a significant portion of materials as fuels, where such dewatered sludges are managed in a manner that preserves the meaningful heating value of the materials. Classification also depends on the amount of heat input capacity, (in British thermal units per hour: BTU/hr), and whether it is a seasonal/limited-use unit. CTI has the expertise to classify each boiler unit. We also have experience with converting boilers from one unit type to another. By converting a unit from one classification to another, the owner/operator can ease the burden of emission limits imposed on them as well as increase efficiencies. For example, by converting an existing unit from a stoker designed to burn wet biomass to a hybrid suspension grate, designed to burn wet biomass, emission limits for particulate matter change from 0.037 pound/million Btu heat input to the boiler to 0.44 pound/million Btu and for CO change from 1500ppm to 2800ppm. A boiler tune-up is the act of reestablishing the air-fuel mixture for the operating range of the boiler combustion operations. Oxygen and unburned fuel (carbon monoxide is generally the indicative measurement) are balanced to provide safe and efficient combustion. Carbon monoxide (CO) Oxygen (O2) and Nitrogen Oxide (NOx) concentrations are also measured to ensure proper burner operation. Tune-ups are performed according to manufacturer’s specifications. If specifications are unavailable, tune-ups are prepared according to industry standards for the boiler configuration, burner/stoker type, fuel being burned, and steaming rate. The deadline for completing the initial tune-up for existing Boiler Area source is March 21, 2014 and for Boiler MACT sources is January 31, 2016. For the initial tune-up, you must conduct a performance tune-up and submit a signed statement in the Notification of Compliance Status report that indicates that you conducted an initial tune-up of the boiler. If a New Source is purchased: The first annual, biennial, or 5-year tune-up must be no later than 13 months, 25 months, or 61 months, respectively, after the initial startup of the new or reconstructed affected source. Facilities must conduct a one-time energy assessment for all existing affected boilers and process heaters no later than March 21, 2014 for Boiler Area Sources and January 31, 2016 for Boiler MACTs. The energy assessment is prepared to assure compliance with EPA’s National Emissions Standard for the Hazardous Air Pollutants (NESHAP) rule as listed in the Federal Register USEPA 40 CFR Part 63. Focusing on steam and process heating systems, the in-depth assessment endeavors to identify immediate and long term opportunities to save energy, reduce emissions and improve operations. Examination is given on energy efficiency improvements, waste minimization and pollution, and productivity improvements. The energy assessment applies only to existing affected boilers and process heaters and their energy use systems. An energy use system includes the following systems located on-site that use energy from the affected boiler or process heater: process heating; compressed air systems; machine drive (motors, pumps, fans); process cooling; facility heating, ventilation, and air conditioning (HVAC) systems; hot heater systems; the building envelope, and lighting. The CTI energy assessment includes but is not limited to such components as the feed water system, the combustion air system, the boiler fuel system, burners/stokers, fuel feed, combustion control, furnace grate management, blow down system, emissions control, steam distribution, condensate return, end users of steam, and associated equipment. You must prepare the site-specific test plan before conducting a required performance test. If you demonstrate compliance with any applicable emission limit through performance testing and subsequent compliance with operating limits of a continuous monitoring system (CMS), you must develop a site-specific monitoring plan. CMS includes continuous parameter monitoring system (CPMS), continuous emission monitoring system (CEMS), and continuous opacity monitoring system (COMS). You must submit this site-specific monitoring plan, at least 60 days before your initial performance evaluation of your CMS. You must operate and maintain the CMS in continuous operation according to the site-specific monitoring plan. Continued compliance certification must be submitted no later than July 31 or January 31, whichever date is the first date following the end of the semiannual reporting period. The semiannual reporting periods are from January 1 through June 30 and July 1 through December 31.